Analysis of the formation of surnames by the Jewish population of the 19th century Russian Empire. Description of the cultural and legal context of Ashkenazi Jewish surnames in Russia with examples taken from census records. Provides insight to genealogists on the legally mandated creation of different surnames within individual families followed by a period of relative surname stability into the 20th century. Surname derivation from toponyms with the “sky” suffix were most common followed by patronymics with the “vich” suffix and then derivation from occupations or nicknames. As a result of these Russian laws and mandates, many non-related Jewish individuals acquired the same surname, while many related people acquired different surnames. This situation has created many challenges for genealogists who try to trace the ancestry or locate descendants of a particular Jewish lineage, many of whom have different surnames, as well as for interpreting the different results of DNA tests for Jewish descendants, who are assumed to be related because they share a common surname. The purpose of this review article is to explain the various laws and mandates pertaining to Jewish surnames in the Russian Empire, so that those who are interested in Jewish genealogy will better understand the complexities of Jewish surname adoption and use. The first section of the article presents a concise history and overview of these laws and mandates. Two excellent reference sources which were particularly helpful to the authors in preparing this section include: “A Dictionary of Jewish Surnames from the Russian Empire,” and “A Dictionary of German-Jewish Surnames. The second section of this article examines the effect that these Russian laws and mandates had on the adoption and use of surnames by Jews living in the Pale of Settlement. For each of these laws and mandates, we provide actual examples of original censuses or other genealogical documents which demonstrate the effect that the specific law or mandate had on the adoption and use of Jewish surnames. Since biblical times, Jews have historically used Hebrew patronymic names. In the Jewish patronymic system the first name is followed by either ben- (son of) or bat- (daughter of), followed by the father’s name. Surnames were not unknown among the Jews of the Middle Ages, and as Jews began to mingle more with their fellow citizens, the practice of using or adopting civic surnames in addition to the “sacred” name, used only in religious connections, grew commensurately. Among the Sephardim (Jews of Spanish, Portuguese, Middle Eastern, or North African descent) this practice was common long before their exile from Spain in 1492. Among the Ashkenazim, whose isolation from the mainstream majority population in the lands where they lived was more complete, the use of surnames only started to become common toward the end of the 18th century in most places. Until the emancipation of the Jews in the late 18th century, most Jews in Europe used the traditional system of patronymic names (e.g., Eliyahu, son of Aharon). Exceptions included Jewish communities in cities such as Prague or Frankfurt am Main, where many of the surnames were derived from house-signs; and rabbinical dynasties, which often used a town name, typically the birthplace of the founder of the dynasty (e.g., Shapiro, from the town of Speyer, Germany). Such surnames were much easier to shed or change than they would be today, and did not have the official status that modern ones do. The process of assigning permanent surnames to Ashkenazi Jewish families began in Austria. On July 23, 1787, five years after the Edict of Tolerance, the Austrian emperor Joseph II issued a decree called Das Patent über die Judennamen which compelled the Jews to adopt German surnames. Prussia mandated the adoption of Jewish surnames soon after Austria, beginning with the city of Breslau in 1790, the Breslau administrative region in 1791, and the Liegnitz region in 1794. Napoleon also, in a decree of July 20, 1808, insisted upon the Jews adopting fixed names. His decree covered all lands west of the Rhine; and many other parts of Germany required surname-adoption within a few years. In 1812, when Napoleon had occupied much of Prussia, surname adoption was mandated for the unoccupied parts; and Jews in the rest of Prussia adopted surnames in 1845. During the early 19th century, corresponding Jewish surname laws emerged in other regions of Europe: West Galicia, covering Krakow, Lublin, Radom, Siedlce, and Kielce (1805), city of Frankfurt-am-Main (1807), France (1808), Grand Duchy of Hessen-Darmstadt (1808), Grand Duchy of Baden (1809), Kingdom of Westphalia (1808, 1811), Kingdom of Prussia (1812), Kingdom of Bavaria (1813), Kingdoms of Wurttemberg and Hannover (1828), Prussian province of Posen (1833), Kingdom of Saxony (1834), and Oldenburg (1852). Hence, the great majority of European Ashkenazic Jews took their surnames during the period from the end of the 18th century to the middle of the 19th century. Between 1772 and 1815, the map of Eastern Europe changed dramatically as a result of three partitions of Poland and the Napoleonic wars. Prior to this period, although a great many Jews lived in Poland, they had been prohibited from living in the Russian Empire. Over the centuries, many regulations had made it impossible for Jews to come into Russia, the last of which appeared on December 4, 1762, in a manifesto signed by Czar Catherine II “the Great” proclaiming that henceforth all foreigners were permitted to live in Russia, except the Jews. In 1772, 1793, and 1795, Russia annexed Polish territory, each time acquiring large Jewish populations. As a result of these territorial changes, a massive Jewish population abruptly became subjects of the Russian czar. On June 23, 1794, the Pale of Settlement – the only area in which Jewish settlement was permitted – was defined. Migration of the new Jewish subjects into other areas of the Empire was vigorously restricted. At the end of the 18th century after the third partition of Poland, the Russian Empire acquired approximately two million Jews who had been living in Polish territories annexed by the Russian Empire. This large Jewish population generally did not have surnames. The standard naming pattern used at that time in all Russian documents for Jewish men was to list the given name and a patronymic that ended in ovich or evich, meaning “son of” (e.g., Shmuel Mordkovich). An example of a census of the late 1700s which predates the appearance of Jewish surnames, is shown in the 1784 census for the town of Slutsk, then part of the Grand Duchy of Lithuania, now Belarus (Figure 1). Of the 16 Jewish families listed on this representative composite page of the census, there were no surnames listed for any of them. Most were listed by first name and patronymic name; a few were listed by first name and nickname. Names such as Hirsh Yankielovich (Hirsh, son of Yankiel) on line 1, Shiman Osherovich (Shimon, son of Osher) on line 2, Hirsh Iserovich (Hirsh, son of Iser) on line 3, Osher Shimanovich (Osher, son of Shiman) on line 4, and Leyba Eliovich (Leyba, son of Eli) on line 5, which appear to be surnames, are actually patronyms. A composite image showing examples of Jews in the pre-surname censuses of the late 1700s. Individuals are listed by are listed by their first name followed by either a paternal name or a nickname. Slutsk was part of the Grand Duchy of Lithuania and belonged to the Polish Commonwealth in 1784, but was annexed by the Russian Empire in 1793. Several people were also listed on this census by their first name and their nickname or occupation instead of their patronymic name. Line 6 lists Berko Tokar. Tokar is a Polish nickname meaning turner or lathe operator. Line 10 lists Szloma Szamasz. Szamasz is a Jewish nickname meaning sexton or beadle in a synagogue. Line 11 lists Leyzer Bakalarz. Bakalarz is a Polish nickname meaning teacher. 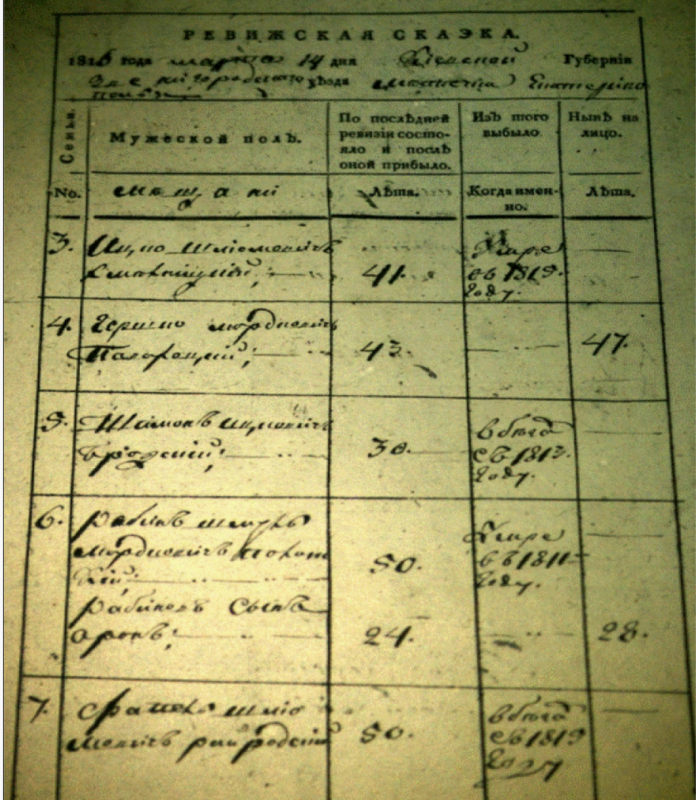 Yet another example of a census which predates the appearance of Jewish surnames, as cited in Beider, refers to a 1799 list of all households from the town of Vitebsk that enumerates 320 Jews by both their given name and either a patronymic ending in ovich or evich for men, or a name ending in ova with a masculine given name as the root for women. In contrast to the Jews, all Vitebsk Christians in the same document are listed with a given name and a surname. The lack of surnames created great difficulties for the governing of this massive Jewish population. Especially complex was the procedure for checking tax collections. Gavril R. Derzhavin, a famous Russian poet, was the first to write about the necessity of assigning surnames to Russian Jews, pointing out numerous civil inconveniences related to the absence of fixed family names. Although the exact years of the assignment of surnames is unknown, it appears from revision lists that most Russian Jews acquired their surnames during the decade that followed the decree of 1804. According to Beider for instance, in the Pinsk Jewish Revision Lists of 1816 there were 1,774 persons out of 2,017 (88%) who appear with a surname. 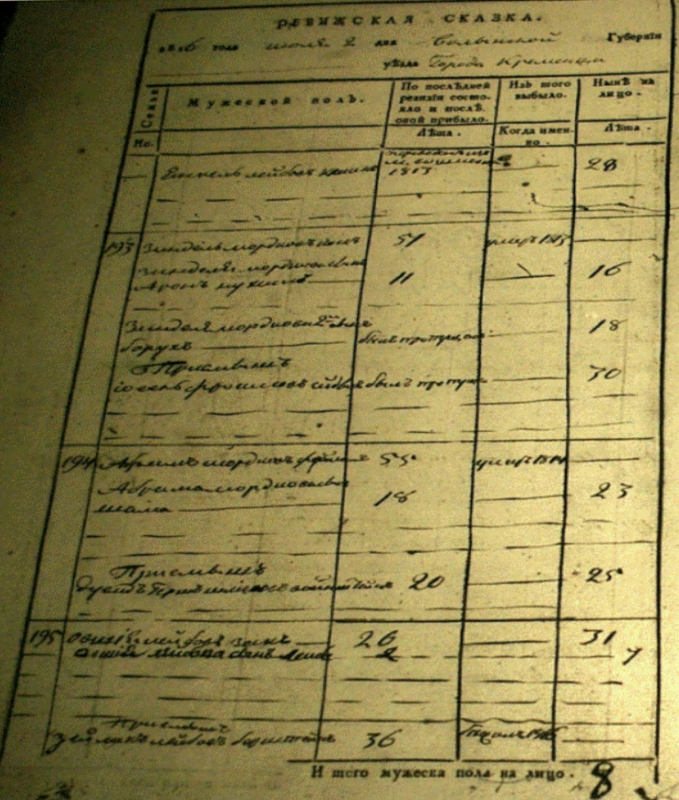 An example of a census following the czar’s edict of 1804, which mandated the adoption of Jewish surnames, is shown by the 1811 Slutsk census. 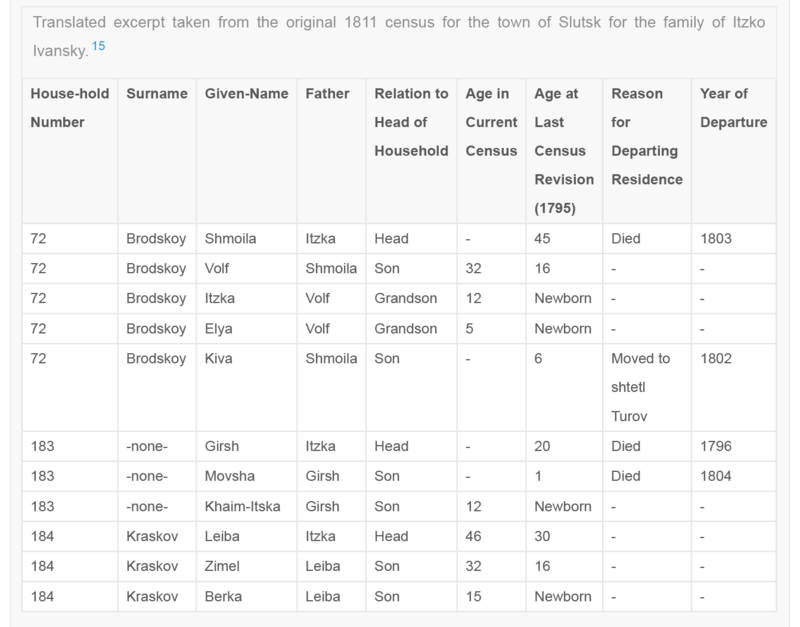 This census page shows the same family that appears in the 1784 Slutsk census. The data in Table 1 represents a translated excerpt that was taken from the original 1811 Slutsk census, and illustrates how members of the same family who lived in separate houses acquired different surnames. 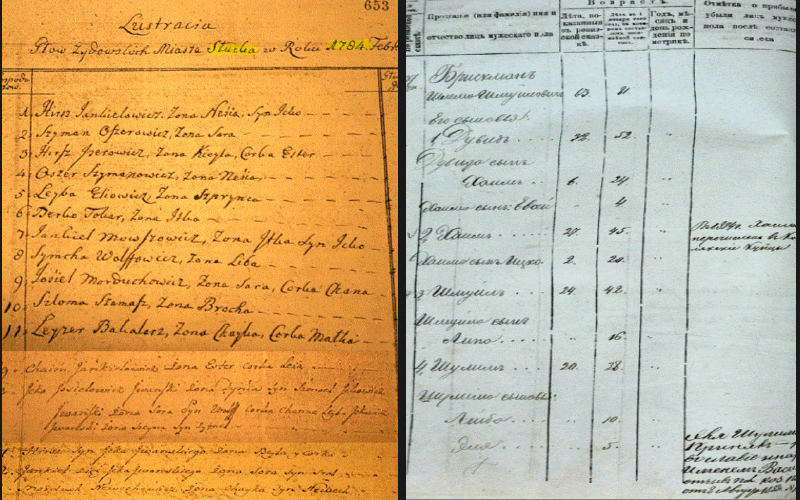 This census shows the two sons from Itzko’s household, Shmoila and Leiba, who lived together in 1784, now living in different homes (Table 1, households 72 and 184). As a result, they acquired their own distinct surnames – Brodskoy and Kraskov. The third son, Girsh, died in 1802 and did not have a chance to acquire his own surname. As a result, his family is listed in the 1811 census with no surname. His son, Khaim-Itska, later acquired the Ivansky surname that was his father’s nickname in 1784. Leiba’s and his late brother Girsh’s families lived next door to each other in 1811 (Table 1, households 183 and 184), and Leiba most likely helped to support his brother’s family. As illustrated by these examples, the direct result of the 1804 edict was the creation of many distinct family units, each having their own unique surname, regardless of their previous familial relationships. This process was repeated in numerous Jewish towns and villages throughout the Russian Empire. Although no one knows the exact number, it is likely that this surname adoption policy resulted in the creation of many thousands of new surnames, a fact which has obvious and important implications for Jewish genealogy as it is practiced today. The fact that this provision was included indicates that the Jewish surname law of 1804 had not been followed as rigorously as had been hoped, and that a significant number of Jews had either not adopted surnames, or had changed them once adopted. Under the czarist edicts, there were many ways in which Jews selected or received their surnames, and different areas and jurisdictions had different rules. Surnames could be adopted from previously existing nicknames, occupations, or family names. In the absence of a nickname or family name, new surnames could be chosen by those who would bear them. There are many examples, however, where it appears that Jewish surnames were simply assigned to people. It is plausible to assume that the methodology for constructing these surnames was developed by the local Jewish community council. The artificial nature of the surnaming process produced many features that made Jewish surnames a unique group of names, quite different from the surnames of Christians who lived in the same area. While the percentage of patronymics among Jews was smaller than among the Slavic population, artificial and toponymic surnames are much more common among Jews. For example, the Kiev Guberniya (province) is the source for a large number of original Jewish names. Their distribution by type is peculiar – in comparison to other provinces, there is a small number of patronymics, and metronymics are almost non-existent, while surnames derived from toponyms are by far the most commonly used – a large majority of which end in the suffix skij. In the southeastern part covering Cherkasy and Chigirin their bearers cover about two-thirds of the total Jewish population, the highest percentage for all of the Russian Empire. Such a high frequency of one specific naming pattern is unlikely to be by chance. As a result, this group of surnames strongly implies the active participation of the local administration, or possibly the Kahal, in the surnaming process. An example of the adoption of Jewish surnames which were derived from toponyms is shown in the 1816 Zvenigorodka census for the town of Ekaterinopol (now Katerynopil), Ukraine (Figure 2). All families listed on this page have toponymic surnames, ending with the suffix –skiy (meaning from). Generally speaking, the Jewish attitude toward their new surnames was negative. While Jews have traditionally paid particular attention to their names, the forced adoption of surnames was not generated from within the Jewish community; rather, it was ordered by the Russian governmental authorities. Since it was obligatory to follow the law, almost all Russian Jews received surnames at the beginning of the 19th century, but the most common reaction was for the Jews to ignore them. Much evidence attests to Jewish indifference to their new surnames. Eminent religious personalities in 19th century Jewish life rarely were known by their surnames. Chassidic leaders were normally known only by their given names and the place of their activity or origin. Several Talmudists born in the middle of the 19th century are known by acronyms based on their traditional Hebrew names, not by their surnames. Disinterest in their official surnames was not restricted to the famous; it was evident within the Jewish general public. In small communities such as villages or shtetles surnames were of little importance. Most people knew each other, and nicknames were used instead of surnames, a fact amply illustrated in Jewish literature, in the works of Shalom Aleichem, and others. Due in part, perhaps, to the attitude of the Jews toward their surnames, the Czar’s edicts of 1804 and 1835 which pertained to Jewish surnames in the Russian Empire were followed by several additional edicts. On December 19, 1844, a edict was issued which abolished the Kahal. This edict stated that henceforth Jews would be governed according to general legislation, and that after the general revision (census) each Jew would be informed about his personal and hereditary name that was to be used in all transactions. Illustrating two examples where Jews were baptized and accepted new patronymic forenames but their surnames were not changed. On February 6, 1850, the State Council opinion signed by the czar prohibited surname changes, even for baptized Jews. Although the last statement was later softened to allow for surname changes among baptized Jews serving in the military, both the 1844 edicts, and the 1850 surname law reflected the increasing legal scrutiny that the issue of Jewish surname change was coming under, by the mid-19th century. Representatives of the Russian government usually enforced these regulations; hence surname changes made by non-baptized Jews during the second half of the 19th century, and extending into the early part of the 20th century, up until the Russian revolution in 1917, were illegal. This surname retention policy is illustrated by the Kiev church baptismal record shown in Figure 3. This document contains two records of Jewish baptisms. In both records, Jews accepted new patronymic names: Sura, daughter of Gilya Zhezmer, became Sophia Zhezmer, daughter of Nikolai; Roman, son of Froim Bengart, became Roman Bengart, son of Ivan. In both cases, their Jewish surnames were not changed. Another example of the legal difficulties involved in changing surnames, even among Jewish converts to Christianity, is shown in the 1876 Jewish census for the town of Pereyaslav, Ukraine in Figure 4. A comment was added to the record for Elia Briskman noting that he was baptized but retained his surname. 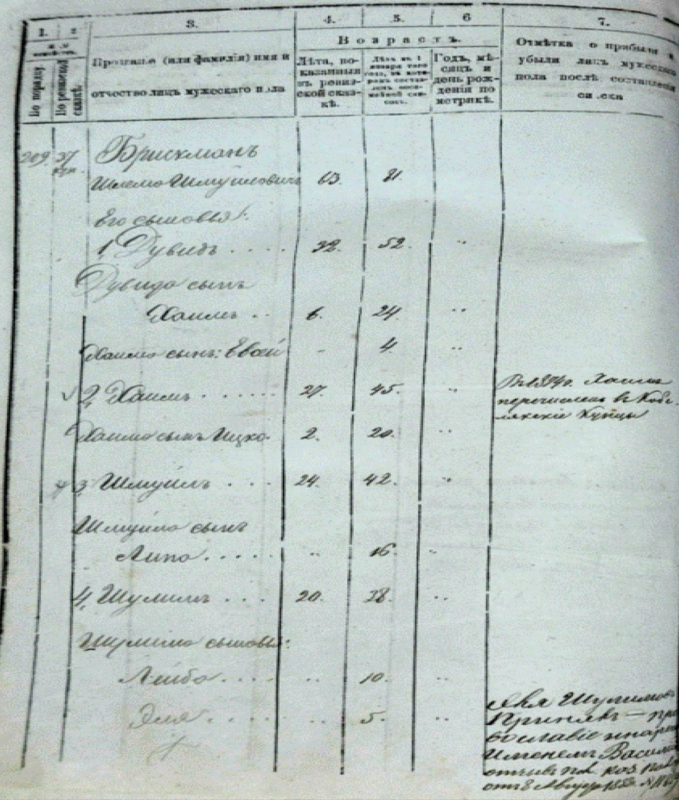 This Pereyaslav census page lists the family of Shlemo Briskman, son of Shmuil. 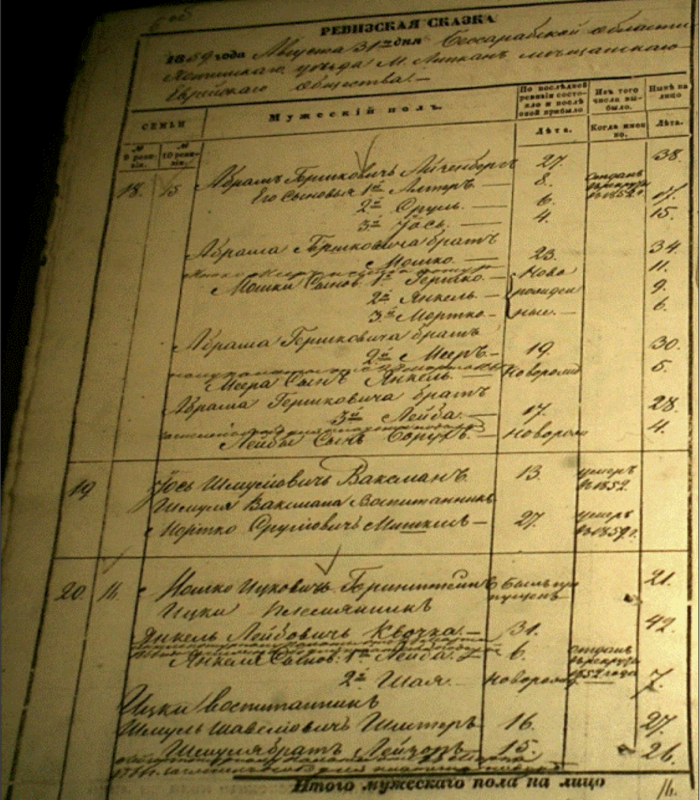 Shlemo’s grandson, Elia, was 5 years old in 1876, and later, a comment was added to the census record indicating that in 1888, Elia was baptized, and he acquired the first name Vasiliy. However, his original Jewish surname Briskman remained the same. Jewish civil rights were further restricted by the issuance in 1882 by Czar Alexander III, of the “Temporary Regulations regarding the Jews” also known as the “May Laws.” These so-called “temporary” regulations, which remained in effect for more than thirty years, forbid the issuing of mortgages and other deeds to Jews; forbid them from settling anew outside of towns and boroughs, and also forbid them from transacting business on Sundays and on the principal Christian holy days. In subsequent years, other repressive laws were enacted. Quotas were enacted limiting the number of Jews admitted to high schools and universities to their percentage of the general population. In 1892, new measures banned Jewish participation in local elections despite their large numbers in many towns of the Pale. In 1893, the “Law Concerning the Names” imposed criminal punishment on those Jews who tried to adopt Christian names, and dictated that Jews must use their birth names in all business dealings, writings, advertisements, and the like. Although the May Laws were not enacted with the specific issue of Jewish surnames in mind, it is important to understand them in terms of their historical context, and the chilling effect that they had on the Jewish citizens in the Pale of Settlement regarding their rights of surname adoption and change, transfer and inheritance of property, and other civil and legal matters involving the use of surnames. Ancient Roman Laws for child adoption were practiced in the Russian Empire until the time of Peter the Great. New adoption laws appeared during the rule of Catherine the Great, in the late 1700s, and further development happened during the rule of Czar Alexander I in the early 1800s. There were three recognized classes of child adoption: for Nobility, other Russian citizens, and foreigners. For each of these three classes, there were different rules, both material and formal. These adoption laws narrowly defined under what circumstances children could be adopted, and which classes could adopt them. In most cases, legal adoption, as we know it today, was not an option for Jews. Instead, when Jewish parents assumed the care for a child, they became step-parents. The child was still legally considered as belonging to their biological parents, and their surname could not be altered or changed. The Statute of Adoption, promulgated on March 12, 1891, secured everyone’s right in the Russian Empire (foreigners as well) to adopt children. Though progressive for the time, the Statute of Adoption contained regrettable discriminatory aspects. Jews beyond the Pale of Settlement were not allowed to adopt persons of their own faith, and adoption of persons of other denominations was also forbidden. In 1902, Russian adoption laws were liberalized a bit as they pertained to the Jews, but transfer of the adopted child’s surname was permitted only under very limited circumstances. Regarding adopted children, the “Decree of the Government of the Senate” pertaining to permanent residency in outside places for Jews: “Jews can adopt under the general laws of the Empire only those of his co-religionists, who themselves have the right to reside throughout the Empire.” In other words, Jews who were living in the Pale of Settlement could only adopt other Jews who were living in the Pale, and Jews who had the rights to live outside the Pale could only adopt Jews who also had the right to live outside the Pale. Also covering child adoption, Civil Code, article 145 stated: “Adopting other people’s children is not allowed if the person adopter has its own legitimate or legitimated children.” This provision meant that Jews who already had their own children could not legally adopt children, and transfer their surname to them. This provision harkens back to the roots of Russian adoption law, which was concerned with identifying an heir for the purpose of inheriting property, and preserving social class. If a family already had children (heirs), they could not claim any new heirs from a different family. This provision of the law applied to non-Jews as well as to Jews. Adoption of illegitimate children (Civil Code, article 152): “Adopter may transmit the adopted his surname, if the adoptee does not enjoy greater rights condition in comparison with the adopter.” In other words, a man could only adopt a child from the same or lower social class; if he was from the bourgeois or peasant class, he could adopt a child from the same bourgeois or peasant class, but he could not adopt a child from the higher merchant class. Although the more liberalized Russian civil laws of the early 20th century permitted the adoption of a Jew by another Jew under certain circumstances, the transfer of the paternal name from the adoptive father to the adopted child was allowed only when the family had no other children, or when the child was an illegitimate foundling, and had no patronymic or surname. The net effect of these child adoption laws on Jewish families was to discourage legal adoption with the transfer of the paternal surname through the courts, and to encourage step-parental relationships instead. The authors have examined many Russian census records from the 19th and early 20th centuries, and in nearly all cases, whenever a Jewish man remarried, the children of his second wife retained the surname and the patronymic name of their biological father, and the new parent became the children’s step-father. Three examples of Russian adoption policy where step children retained their original surname. An example of the effect of Russian adoption laws in influencing Jewish paternity arrangements, and precluding the transfer of Jewish surnames to step-children, is shown in the 1816 census for the town of Kremenets, in the Volyn Gubernia (Figure 5). • In family #193, Zindel Katz, son of Mordko, had two children: Aron Nukhim and Borukh. His stepson was Iosel Yeydvich, son of Froim. • In family #194, Abram Freyman, son of Mordko, had a son Shaia. His stepson was Duvid Gersh Vainshtein, son of Shlioma. • In family #195, Ovshiya Zak, son of Leiba, had a son Leiba. His stepson was Zeylik Bershtein, son of Leiba. An example of both a stepson and step-grandson retaining their original surname. Another example of the effect of Russian adoption laws on Jewish paternity arrangements, is shown in the 1834 census for the town of Gorodnya, in the Chernigov Gubenia, now Ukraine (Figure 6). • In family #6, Leiba Chernyavsky, son of Volf, had three sons: Volka, Girsha, and Livik. His stepson and step-grandson are Leiba Sorkin, son of Leib, and his son Girsha Sorkin. Example of stepson retaining surname and having father noted as well. A third example of the effect of Russian adoption laws on the transfer of Jewish surnames is shown in the 1835 census for the town of Zolotonosha, in the Poltava Gubernia, now part of Ukraine (Figure 7). • In family #16, Mendel Gaisinsky, son of Avram, had four sons: Movsha Leiba, Todrish, Zusman, and Elia. His stepson is Moisei Rabinovich, son of Itska. Families 19 and 20 contain examples of step children retaining their original surname. A fourth example of the effect of Russian adoption laws on the transfer of Jewish surnames is shown in the 1859 census for the town of Lipkany, in Bessarabia, now Moldova (Figure 8). • In family #20, Moshko Gorinshtein together with his step-brothers, Shmul and Leizor Shister, sons of Shavel. Family 88 illlustrates case where children retained their surname when adopted by their maternal grandfather. A final example of the effect of Russian adoption laws on the transfer of Jewish surnames is shown in the 1888 census for the Sosnitsa uezd, in the Chernigov Gubenia, now Ukraine (Figure 9). • In family 88, Samoilo Ilyin, son of Berka, has three children: Moisei-Berka, Girsha-Froim, and Elta. His step-children, Pesya and Toba-Khasya, are orphans from his late son-in-law, Samuil Lyubinsky. In each of the individual census examples discussed above, stepsons retained their biological father’s surname. These findings are consistent with Russian adoption law, and are representative of other Russian census documents from this period. Until the emancipation of the Jews in the late 18th century, most Jews in Europe used the traditional system of patronymic names. This was particularly true in the Russian Empire, where Ashkenazi Jews living in the small towns and villages of the Pale of Settlement, had little use for hereditary surnames. Most people in these small towns knew each other, and patronymics or nicknames were used instead of surnames. All of these traditional naming practices changed with the Czar’s edicts of 1804 and 1835. These edicts required every Jew to forever retain, without alteration, a known inherited or legally adopted surname. Although instances of illegal surname changes undoubtedly did occur, especially among those who tried to avoid military conscription in the Russian army, these instances were, in all likelihood, the exception rather than the rule, as it was up to the local Jewish community leadership to determine which young men would serve in the military. An important aspect of these edicts and the ensuing regulations that often goes overlooked, was the emphasis on adopting unique surnames for the occupants of each separate household. This was done largely for taxation and military conscription purposes. The direct result of these edicts was the adoption of different surnames by members of the same family, if they happened to live in different residences, resulting in the creation of numerous subdivided family units of interrelated people having different surnames. Although administratively expedient, the inevitable consequence of this production of new surnames on such a grand scale, was the loss of familial contacts and connections across the generations. This has obvious and important implications for the practice of Jewish genealogy. There is a widely held belief among many that because Jews were largely free to choose their own surnames, that most did so. However, a high frequency of specific naming patterns in various regions of the Russian Empire makes this unlikely, and strongly implies the active participation of Jewish community leaders, as well as local Russian authorities, in the surnaming process. There is another widely held belief that many Jewish children were adopted by neighbors and relatives, and their surnames changed, in order to avoid conscription into the Russian military. However, for most of the 19th century, Jews were forbidden from adopting children, and even after Russian civil adoption laws were liberalized somewhat during the early 20th century, legal adoption and the transfer of paternal surname was permitted only in rare circumstances. Due to these strict Russian civil child adoption laws and policies, when Jewish parents with children remarried in the Russian Empire, they generally became step-parents rather than legally adoptive parents. Russian censuses from widely different towns, as well as from different periods throughout the 19th century appear to bear this out, as the children of second marriages nearly always retained their original surnames on the censuses. At the same time, however, the frequent adoption of different surnames by individual members of the same family during the early part of the 19th century resulted in the creation of numerous family units of related people having different surnames. In addition to the “Americanization” of Jewish surnames, this may explain, in part, why so many closely-related Ashkenazi Jews with Russian ancestries have completely different surnames. This has greatly complicated their efforts to trace their ancestries, or to locate common ancestors with individuals with whom they may be a genetic match. Both of these seemingly contradictory characteristics – the legally mandated creation of numerous separate, yet interrelated families, each having their own unique Jewish surname, and the relative stability of these surnames over most of the 19th and early 20th centuries in the Russian Empire – have combined to create a complex tapestry of Russian-derived Ashkenazi Jewish surnames, which has important implications for the practice of Jewish genealogy as we know it today. This article was peer reviewed with 3 commentaries. 1. Alexander I, Czar or Russia. Imperial Statute Concerning the Organization of Jews. Article 32, December 9, 1804. Analyzed by Charny, Vitaly. 2. Beider, Alexander. A Dictionary of Jewish Surnames from the Russian Empire, Revised Edition. Avotaynu, Bergenfield, NJ, 2008, p. 10. 3. Cherkasy Archive. 1816 Census for Kiev Gubernia, Zvenigorodka Uezd. Ekaterinopol Jewish Community, March 14, 1816. Fond 452, Inventory 2, File 2, pp. 5-6. 4. Cherkasy Archive. 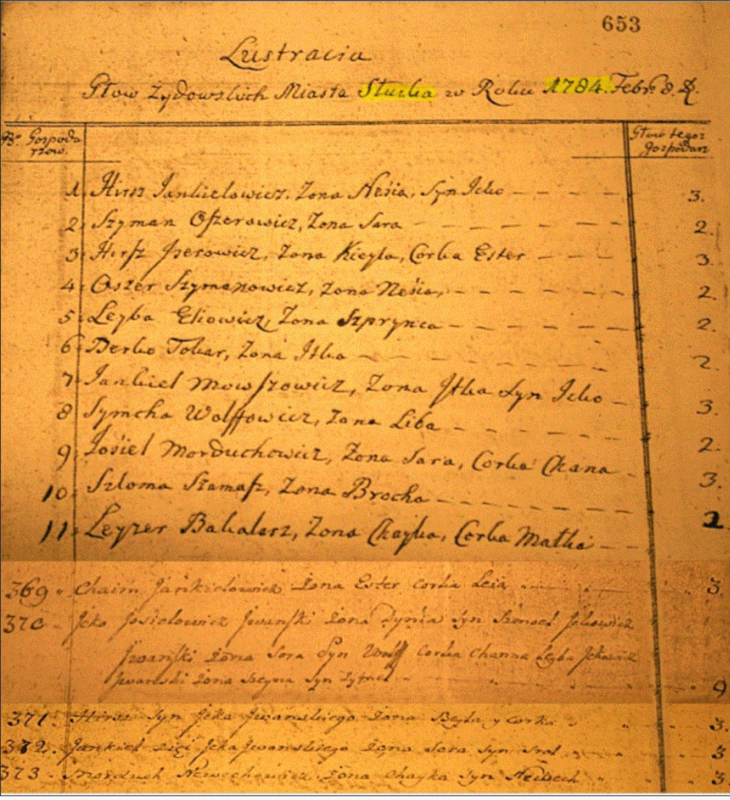 1835 Zolotonosha Census. Fond 402, Inventory 2, File 12, p.12. 5. Chernigov Archive. 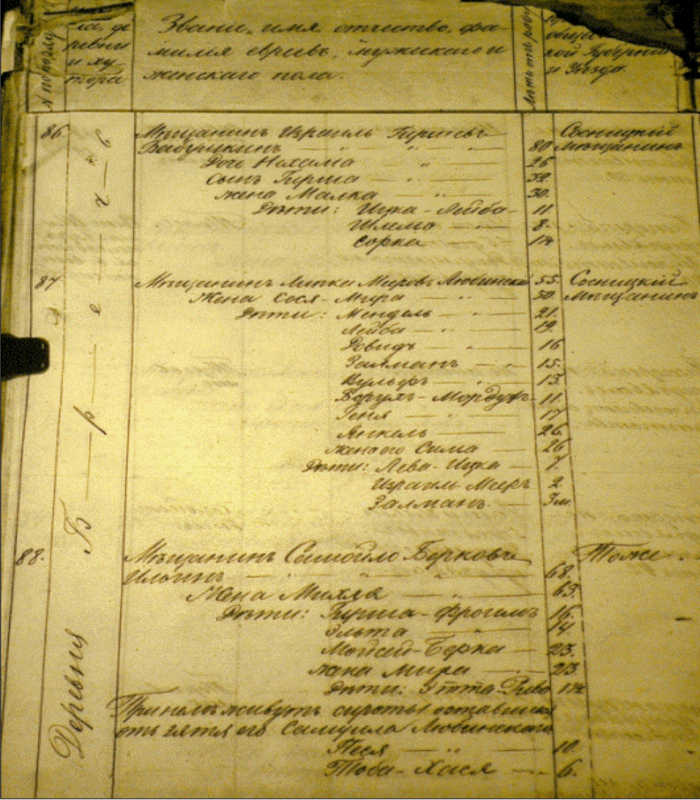 1834 Gorodnya Census. Fond 132, Inventory 1, File 1269, p.3. 6. Chernigov Archive. 1888 Sosnitsa Census. Fond 127, Inventory 14, File 3536. 7. Joseph II, Holy Roman Emporer, Decree of 23 July 1787. 8. Kiev Archive. 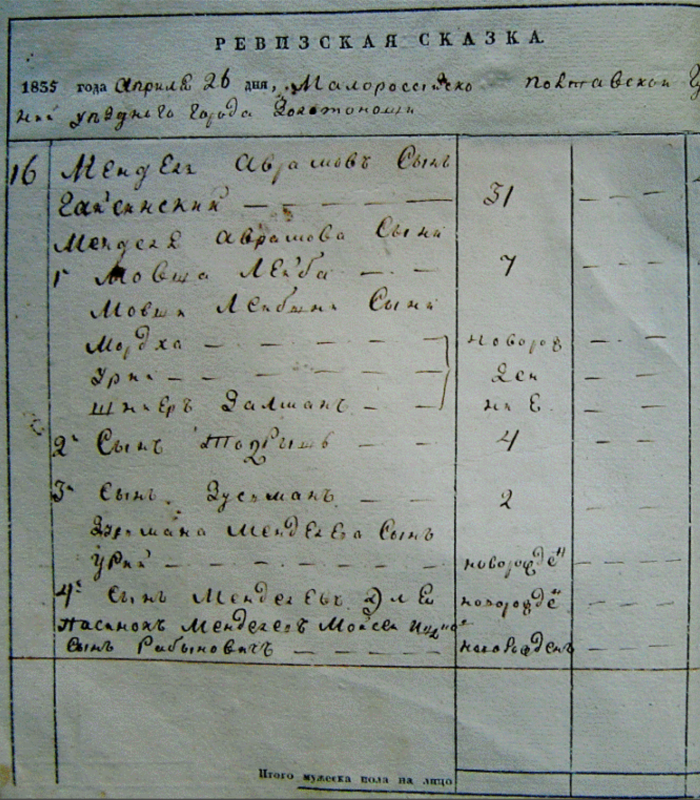 1876 Pereyaslav Census. Fond 534, Inventory 1, File 46, pp. 199-201. 9. Kiev Archive. 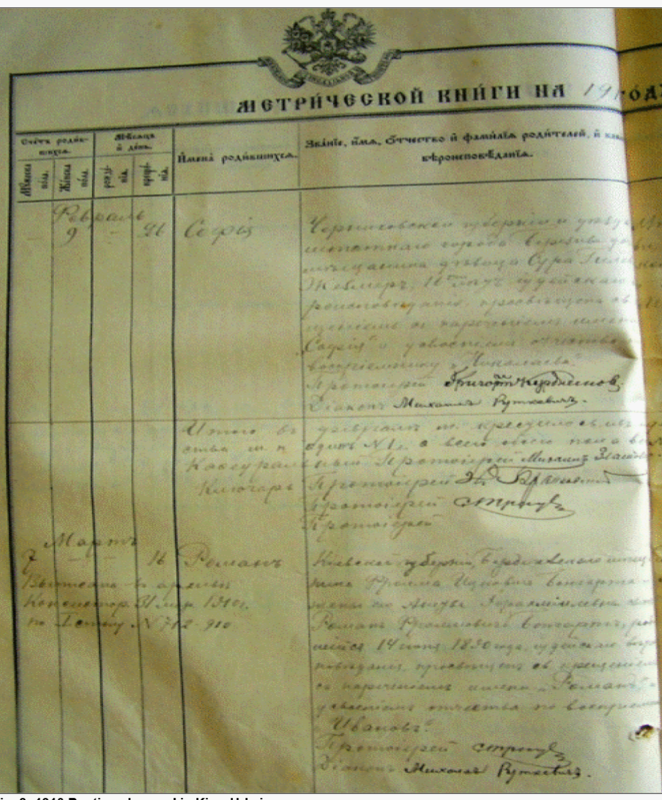 1910 Sofievsky Sobor Church Baptismal Record. Fond 127, Inventory 1080, File 275. 10. Kishinev Archive. 1859 Lipkany Census. Fond 134, Inventory 2, File 553, pp. 6-7. 11. Letova, N V. Adoption in Russian Federation: Legal Issues. Walter Kluwer Publishing House, 2006. 12. Lithuanian State Historical Archives, Vilnius: 1784 Slutsk Census, Grand Duchy of Lithuania 1784 Census/Poll Tax List, Fond SA 3754, p. 653. 13. Maslov, Vladimir G. Adoption of Children from the Ukraine. From Jaffe and Kluwer. Inter-country Adoptions: Laws and Perspectives of Sending Countries. Academic Publishers, Netherlands, 1995, p. 113. 14. Menk, Lars. A Dictionary of German-Jewish Surnames. Avotaynu, Bergenfield, 2005. pp. 3-4. 15. Minsk State Archive. 1811 Slutsk Census. Fond 333, Inventory 9, File 266. 16. Minsk State Archive. 1816 Slutsk Census. Fond 333, Inventory 9, File 220. [Khaim-Itska acquired or adopted his father’s Ivansky nickname as his surname sometime between 1811 and 1816, as he was listed as Khaim-Itska Ivansky in the 1816 Slutsk census.]17. Morgenstern, Bruce. The Jews of Krakow and its Surrounding Towns. 18. Nicholas I, Czar of Russia. Imperial Statute Concerning the Organization of Jews. Article 16, May 31, 1835. 19. State Archive of Ternopil Oblast. 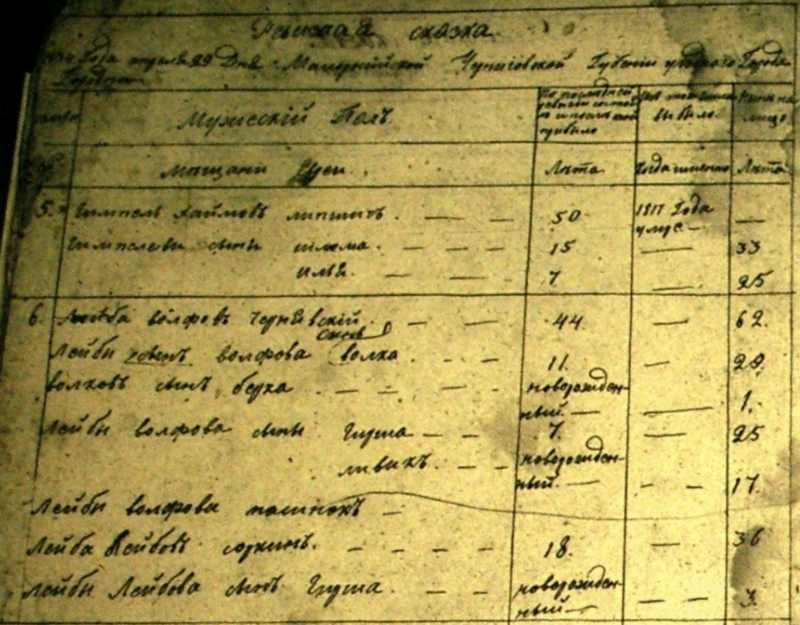 1816 Kremenets Census. Family History Library International Film 2213480, Item 2, pp. 1-475. 20. Tyutryumov, I M. Civil Laws with Explanations and Commentary of the Governing Senate Russian lawyers. Book 1, Statute Publishing, Moscow, Russia, 2004. 26. Moreno, Barry, The Illustrated Encyclopedia of Ellis Island, Fall River Press, New York 2010, p. 205. 29. Paull, Jeffrey Mark, A Noble Heritage – The History and Legacy of the Polonsky and Paull Family in America, Infinity Publishing, 2013.